Due to strong winds today Venice has been hit by a rise in sea level of 1.56m above normal. The result is that nearly all of the city, including St Mark's Square, has been submerged. There are a few Google Maps mashups that show the possible effects of sea level rises on the Earth. 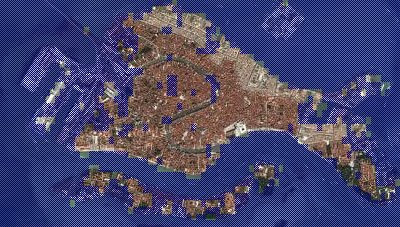 The effect of a one and a half metre rise in Venice suggests that many of these mashups may be over optimistic in their predictions. 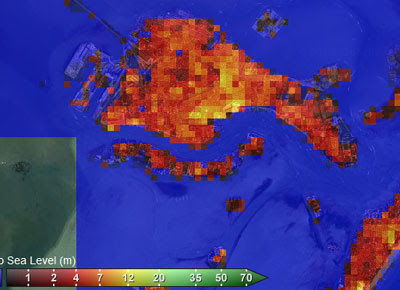 A two metre rise in Flood Maps produces the result in the screenshot below, which seems a little less severe than the actual effect of the 1.56m rise. The Sea Level Explorer rightly predicts that Venice is in serious danger from even a small rise in sea levels. 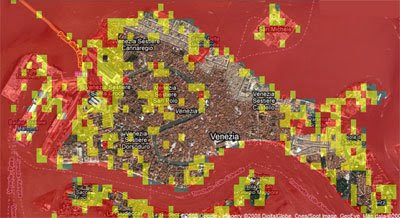 The screenshot below shows that a low level rise could cause serious problems in Venice. This Sea Level Visualisation Mapplet suggests a 1.5m rise would not have the effect that today's 1.56m rise has actually had. You can of course use any of these three excellent Google Maps mashups to visualise the effect of sea rise on your own home.